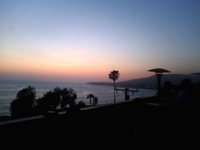 Sellsius Real Estate hosted a real estate webloggers gathering at K'ya in Laguna Beach. The stated purpose was a celebration of Spring in Southern California but the conversation was about the grand opening of the Sellsius Classifieds Site (more on that later). Joe Ferrara and Rudy Bachraty were in high spirits about the launch, the sun was beautiful as it dipped into the Pacific, and we all had a chance to meet and greet other real estate professionals from Southern California. Thanks Sellsius for hosting this fun party. I'll introduce you to the people who visited with links to their weblogs. Take a tour. A lot of fun and really smart people were there last night. Laurie and I may have come from different parents but I'd swear she was my lost sister. Kaye Thomas of Real Estate West in Manhattan Beach hosts Beach Cities Blog. Kaye's a UCLA Bruin and SoCal Native who has been selling homes in Manhattan, Redondo, and Hermosa since 1979. Kaye's that cool chick at the beach who can tell you where the locals surf, eat, and drink, while negotiating a million dollar listing on your behalf. Kelly Kilpatrick of Gold Coast Homes boasts 15 years of experience in real estate and lending in tony Rancho Santa Margarita. I met Kelly on Active Rain and read her weblog A Key to the City. I was psyched to meet Kelly because I love the stuff she does with her listings. Rory Siems of Prudential California specializes in Laguna Beach homes. His weblog is dedicated to South Orange County real estate but I believe his real talent lies in podcasting. Rory's a surfer and I'm a sponger but we share the same waves. His fiancee, Heather, is a sweetheart. Morgan Brown, of New Day Trust Mortgage in Irvine, is a fellow contributor to Bloodhound Blog and author of Blown Mortgage. I was looking forward to meeting the guy whom I admire so much. 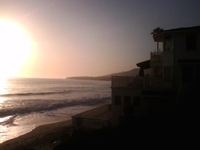 The First Lady of Active Rain, Sara Washburn, rolled down the hill to drink in a Laguna Beach sunset. She and hubby, Jon, are headed back to Seattle from Laguna Beach to be more involved with Active Rain. Sara writes on Active Rain and always has a compliment for everyone she meets. She's beautiful to the core. Tiscza, that's all I'm going to call her because she's a brand name now, writes a weblog called Route 66 Living. It's about life in Claremont where she sells properties with Keller Williams. I've just started reading her stuff and love how she brings her town to life on her weblog. It was a pleasure to meet her and her husband. Loren Nason and his wife came and had a well deserved night out. They have two boys, ages 12 and 3. As the father of a five year old, I traded stories with Mrs. Nason all night. Loren writes a weblog called The Future of Real Estate Technology that is chock full of good advice for Realtors. I'm not forgetting the granddaddy of real estate weblogging, Dustin Luther of Move.com and host of Rain City Guide. I attended Dustin's seminar about Relevance on the Internet. Dustin wrote the landmark post, Linkation, Linkation, Linkation that guides the activities of every serious real estate weblogger today. Certainly, such an austere author would appear larger than life, right? Nope. Dustin's just the coolest guy with whom you can share a bottle of suds. If I did forget someone, I apologize. Please e-mail me and jog my memory. I was the first one there so the 2-3 Coronas I had may have dulled my memory.